Cooks have recipes, builders have blueprints, and handweavers have weaving drafts. There are a few different formats, but all drafts carry the same essential information. There is the tie-up box, the threading pattern, and the treadling sequence. Finally, there’s the drawdown, a graphic representation of how all the threads intersect. The two formats I see most often are the typical American draft (e.g., Handwoven), and the Swedish draft (e.g., VÄV Magasinet). Many American drafts assume jack looms; whereas, Swedish drafts usually assume counterbalance or countermarch looms. However, any loom can weave from any draft. All the draft formats have this in common: The tie-up box is the starting point. The threading pattern and treadling sequence begin at that point, and go out from there. The Swedish draft makes perfect sense (remember, of course, I weave on Swedish countermarch looms). I picture the draft as if it is lying flat in front of me. Swedish draft, with a weft drawdown. American draft, with a warp drawdown. Draft is hanging at the corner of the loom. 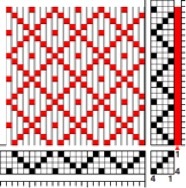 The fabric logically grows in the same direction as the sequence of weft picks as seen on the treadling draft. Getzmann, Ulla, and Becky Ashenden. Weave Structures the Swedish Way. Shelburne, MA: Väv Stuga Press, 2006. Hoogt, Madelyn Van der. The Complete Book of Drafting for Handweavers. Coupeville, WA: Shuttle-Craft Books, 1993. May you flourish at your loom. Thank you for this comparison of the two ways to write drafts, this will make translation much easier. One question. You say, “For a “rising shed loom” (jack loom), use the white squares (or numerals) to tie up rising shafts”. Do you mean this to apply to the American way of writing the draft? Julia, Thank you for asking this question. I need to edit what I wrote and make a correction. The American way of writing the draft usually has numerals for the rising shafts. For a jack loom, use the squares with numerals to tie up rising shafts. The white squares, in this case, are used to tie up sinking shafts. Thanks for helping me clarify! Thanks Karen, a good blog to explain the differences quite clearly. I prefer the swedish way (and yes I have a a Glimåkra floor loom, but it just makes sense to me. Sometimes I get them mixed up but I think it’s good to know both methods. It’s a bit like preferring to beam the warp from the front or the back – you just tend to find what works for you. Thank you again. Hi Alison, I get them mixed up, too. I am so accustomed to the Swedish format that I have to go back and review my notes if I want to “translate” an American draft. Thanks for the comparison post. It will be good to refer new weaver’s to it, so they know there is more than one way for patterns to be written. Here is a bit of additional information for American weaver’s used to jack loom drafts. Many own the book, A Handweaver’s Pattern Book by Marguerite Davison. It was published back when counterbalance looms were the norm. Her drafts are written in the American way, with threading and tie-up at the top. Her tie-up is written for a sinking shed, so marked boxes go down. 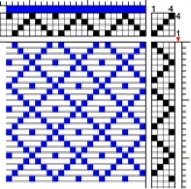 If someone owns a jack loom, in order to see the pattern while weaving, they should tie up the blank squares instead of the x’s. I think other older drafts, such as Atwater, Bertha Hayes, and others also tie up for counterbalanced looms. Hi Jenny, I’m glad you mentioned this! It’s important for a weaver to understand the format of a draft and how to interpret it. My first project on a floor loom was from Davison’s book. My instructor carefully pointed out the author’s note that tells that the drafts are written for counterbalance looms. Thank you so much for adding this important information for weavers used to drafts written for jack looms. Karen, I’m new to all of this, and I’m not able to perceive what you are referring to as black and white squares. Are those the empty squares? So you would tie up all of those, vs one black thread? Hi Sandy, Empty or white? It’s a matter of perception. Yes, in a draft written for sinking shed looms, such as a Swedish draft, you would tie up the empty squares if you are using a jack loom. I don’t think of the squares as “empty,” because for my countermarch loom, I tie up the black squares to the shafts that sink, and I tie up those “white” squares to the shafts that rise. Thank you for this post. I’m a new weaver and have a counterbalance loom. I’ve ordered the book you mentioned. I also really enjoy your posts. Thank you for writing this post. I’m sure it will be very helpful to many of those seeking to expand our repertoire. A friend recently sent me some drafts written in the Swedish manner and, while I figured out most of it, I misinterpreted how the shafts are numbered in relation to the weaver. I’ll have to go back to my Fiberworks entry and edit it or I’ll mess up my weaving. I have two looms, one a computer controlled dobby that uses a programme in the American style. My other loom is a four shaft counterbalance that I brought home from Europe, so I’m somewhat used to reversing the tie-up when I weave with it. My first project ended up upside down on the loom! Sandy, You are going to become an expert on reading different formats of weaving drafts! Bravo! I’m guessing that just about every weaver has accidentally woven a fabric upside down. I know I have. The thing about reversing the order of the shafts and the treadles is that it usually doesn’t really matter all that much. As long as you are consistent, most things will come out just fine, even if they are upside down. I have learned – the hard way – to read the Intro material in any new book I purchase so as to learn which way the author is writing drafts, treadling, and tie-up. It seems there is always a new wrinkle. 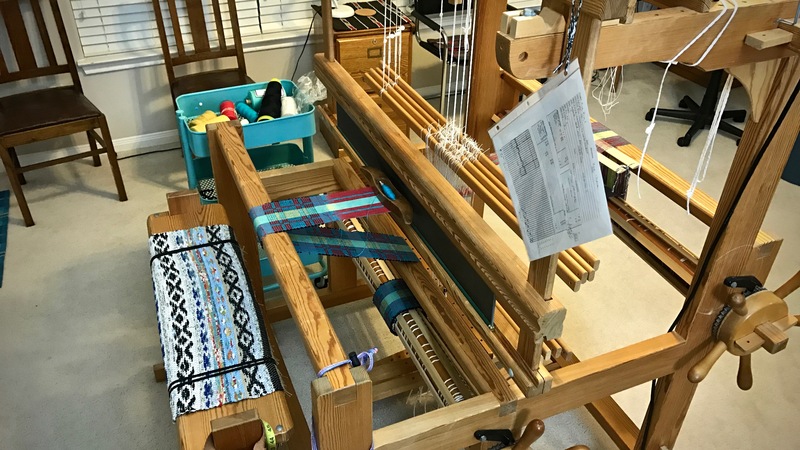 Even though I have a Swedish countermarche loom, I prefer the American way of drafting, which is what I learned way back when there were only three weaving books available, Mary Black, Mary Atwater, and the Davison book. Sue, Yes, read the intro material. It’s not unusual for you to prefer the American way of drafting. I’m sure it’s second nature for you. And those three books should still be in every weaver’s library. Hi! Thanks for this post! Do you happen to have a post about converting between the two types of drafting? I also work on a Glimakra, and know the Swedish way well ( studied with Becky Ashenden and with Maj Britt Mobrand) and I’m trying to learn more clearly how to convert the American drafts I find into Swedish draft style. If not, do you have suggestions for resources that may? Thanks so much!! Hi Danielle, I don’t have another post on this subject, and I have not found any other resources that cover the topic. It can be confusing, to be sure. I have used Fiberworks software to convert drafts, so I can see the image of the cloth. One of the main things to keep in mind is that the tie-up is in reverse – black squares (numbered squares) on an American draft would be white squares on a Swedish draft, and white squares would be black. Hi Marjorie, It takes a while to grasp understanding of all the different parts and how they work together. Doing the tie-up over and over is the thing that has helped me the most. I am glad to hear that this post was helpful to you! And, hooray for going to Vavstuga! Do you mind if I use one of your images on our facebook…https://www.facebook.com/events/893276964394132/permalink/895896417465520/…to explain what a mug rug is? Hi Talia, I would be honored for you to use an image of mine (with credit) on your facebook page.